Aimee Randle: Your firsts, My first. I started this little space almost a year ago, you were turning two and we finally had things somewhat under control. You were walking, talking, communicating and things were all sliding into place and I was able to take a little time and document our days together. Reading other blogs I love the fact that they were able to document all those milestones and first, those exciting moments when everything changes and you take your first step off into the world or speak that first word that would turn into a million strung into one and eventually drive me into insanity and leave me pondering "do you EVER shut up little mouth?!" Moving into our new home and unpacking your gorgeous (still empty) baby book I had a pang of sadness that those memories would leave me and be lost forever in the abyss. I would start to account for them as other older parents I know who claim their little baby love was potty trained at 6 months and reading Tolstoy at 3. I can't lose these fleeting moments so here they are, documented - not in your lovely baby book - but on the world wide web, a far less romantic version, but at least not lost forever. Smile - We like to joke you came out smiling, you just always were. 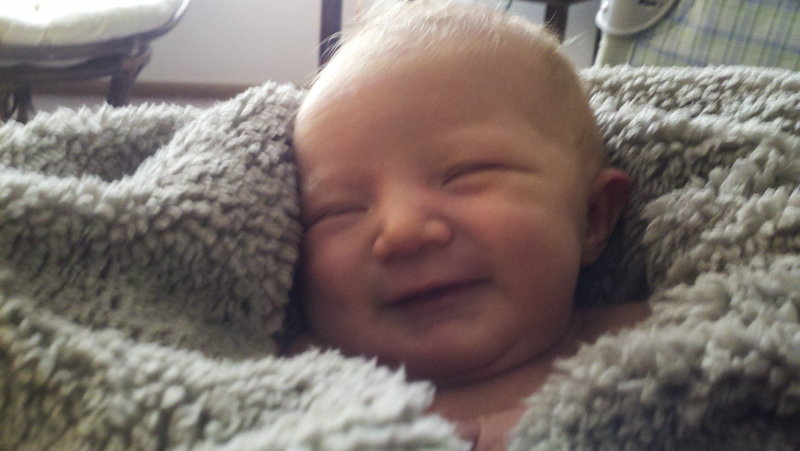 There's a fuzzy picture we hold dearly of you at 4 days old smiling widely and wiggling your little head back and forth squishy cheek to squishy cheek. Laugh - This one goes hand in hand with the first so Ill place them side by side. When you were about 4 months old I got a call from your daddy at the South American restaurant I was working at while we tried to save for our return to Australia. He told me to wait to hear the most beautiful noise that would ever touch my ears. Tears fell down my face in that concrete basement surrounded by cornflour and tortillas as I heard your little laugh, the one I still hold so dear, coming through the phone line. It was so tiny, like your little cries and gentle ways, I never knew a sound could bring so many overwhelming emotions, that daddy of yours, he wasn't joking. Roll Over - This one was a bit freaky. My grandmother was staying with us the first week you were born and we had you in a bassinet in the living room. She has a way of doing grandmother things I don't quite understand (like curling your baby hair on the top of your head with her spit and finger and so on...) plus I was completely baby-ignorant about the going ons of such tiny people. when I walked over to check on you and you were laying on your side I asked her what was the purpose of her placing you like that, directly on your side, arms out like frankenstein. She informed me you had done that all by yourself ... Now I am not a baby expert by any means but Im pretty sure 7 day old babes are not supposed to be doing things like that, freaky, also proof you were always on the move. Tooth - Your first chomper, luckily for me it came with your first birthday, around the same time you weaned your self from feeding. Word - Happy. Seriously, then followed with Happy Baby, on repeat. How sweet the sound. Walking - On Sundays with your papa working double shifts you and I would venture into the city, wander around Bourke Street listening to the buskers. When you were around 11 months old we headed in for our weekly routine and when your pram passed a group of European Gypsy musicians you were so excited we stopped and sat down. At this point you could already shakily stand and I propped you up as you danced to their lovely music in the sunshine. When their rendition of the Jungle Books, 'I wanna be like you' came on you were so excited you turned to me and walked three big steps into my arms. I almost died with excitement, my little lady, you were dancing before you could ever walk. My favorite firsts on this day, the first of a new bright year.